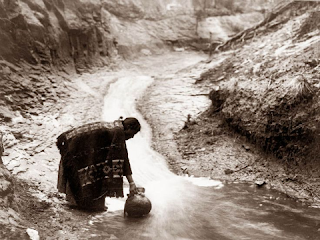 In her novel The Song of the Lark, Willa Cather writes that the Native Americans of the Southwest made pottery to house water once they had housed themselves. All their customs and ceremonies and their religion went back to water, which [is] one of the essential elements of life…[in her novel, the story] continues: “When Thea took her bath at the bottom of the canyon, in the sunny pool behind the screen of cottonwoods, she sometimes felt as if the water must have sovereign qualities, from having been the object of so much service and desire. That stream was the only living thing left of the drama that had been played out in the canyon centuries ago. In the rapid, restless heart of it, flowing swifter than the rest, there was a continuity of life that reached back into the old time. The glittering thread of current had a kind of lightly worn, loosely knit personality, graceful and laughing. Thea’s bath came to have a ceremonial gravity. The atmosphere of the canyon was ritualistic. Sit comfortably in your chair and let your eyelids rest closed. Now take a few deeper breaths and let go a little bit more on each out breath. Allow your breathing to settle and find its own natural rhythm, letting the breath breathe itself. Try not to interfere with this process, and notice how the body moves in response to the breath: the chest expanding and relaxing, the belly rising and falling. If your breath is affected in any way by illness or pain, then just note this with a kindly, gentle awareness. Try to let go of any ideas about how you think it ought to be, and just rest with an awareness of how things actually are for you in each moment. Sometimes it can help to include an image with a sense of the breath: you can imagine a wave flowing up the beach, turning, and flowing back out to sea again, noticing how the movement of the breath has a rhythm very like this. Or you might have another image that you find calming. Use your imagination in your own way to help the mind and the body settle around the breath. Notice any pain or discomfort in your body. Very often we resist feelings of pain or discomfort, and this just leads to more tension, more pain and more discomfort. Use the breath to help soften the hard edges around the pain and allow a tender, gentle awareness to permeate the in- and the out-breaths. As you use the breath to soften resistance to the pain or discomfort, you may notice how the experience of pain is in fact a constantly changing mass of different sensations. Experience how it comes into being and passes away moment by moment. Now you can broaden out your experience even more to invite in the pleasurable dimensions in your body. They might be very subtle, such as tingling in the fingers, some sort of pleasure around your breath, or maybe the feeling of the gentle breeze from the overhead fans brushing against your skin. In your own way scanning through your whole experience and noticing little moments of pleasure, no matter how fleeting – arising and falling with each moment. You may notice that each moment of life contains elements that are painful and elements which are pleasurable. This is the way things are in this world for everyone. Notice the tendency to harden against pain and to grasp after pleasure, and in the noticing relax back to let them both go. And bring your attention back to your breathing. Remember what you learned about yourself, your breathing, your body, pain and pleasure. And come back to this time, this place and this room.